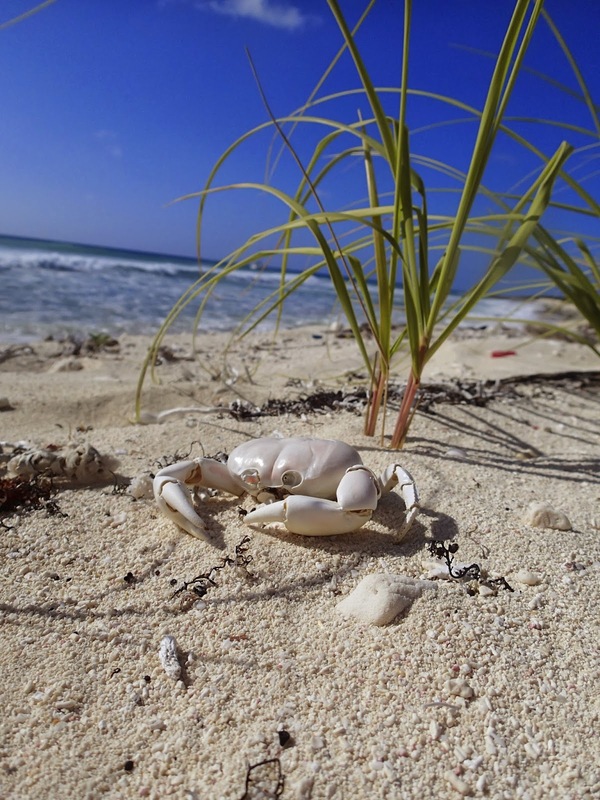 We moved anchorages to the Southeast point of Mayaguana to stage our pass to Turks & Caicos. There was no sand to anchor in and after our anchor caught on a tiny hole in the rock bottom we set the anchor alarm and waited out the day. We were all wanting to go ashore to beach comb, but with the anchor only set in a small hole and big swells crashing on the beach we decided only one person could go. We sent our treasure hunter, Preston. He went on a walk-a-bout for the day and returned just before sunset with………. Preston found rope and tied all his treasures together to swim back to the boat. 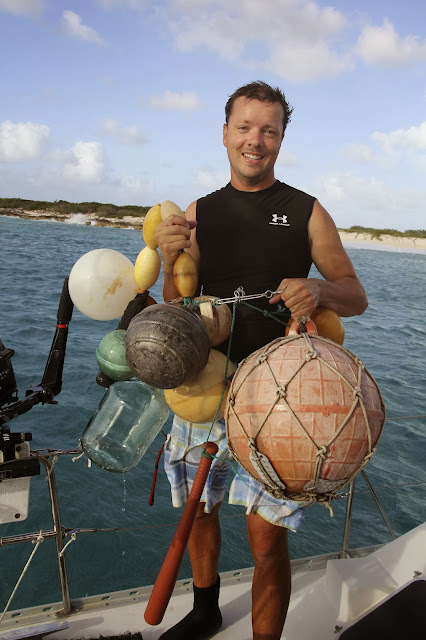 As he was swimming back my mind was racing…..where are we going to put all this junk?….some of those buoys are huge…Turns out he brought it all back to play a joke on me. Though he let me sweat it out for a while before he told me he didn't plan on keeping all of it. He also found a message in a bottle. The message had faded off the paper, but luckily I brought a few art supplies and charcoal was one of them. As I rubbed the charcoal across the paper the message began showing up. We will email the people on the message to let them know their bottle was found. It was really fun to find something someone else threw in the ocean. It made our day! We can't wait to hear back from them to find out where they threw it off their cruise ship and how far it traveled. Our plan was to leave at midnight so we could pull through the Caicos Cut with the sun rising to see reefs. Well we were too impatient and didn’t wait for our weather window. We left last night at midnight off the Southeast point of Mayguana. As soon as we left the anchorage we were being tossed around by waves taller than our boat and some were crashing right over the side. We battled for 11 hours the biggest swells we have ever seen. It was a VERY long and uncomfortable night. We are now safely tied to a dock at a marina in Turks & Caicos. We are dead tired and may just sleep for 3 days straight. Preston and Dan took the grunt of it outside all night getting splashed by salt spray. I hid inside with Lucy because I couldn’t deal with watching each wave grow bigger and bigger. We were to the Caicos Cut by 8:30am this morning and it took another 3 hours to get to the marina. Those 3 hours just about killed us, because we were here and we made it, just not quite yet. We did have an unexpected surprise as we were coming thought the cut. 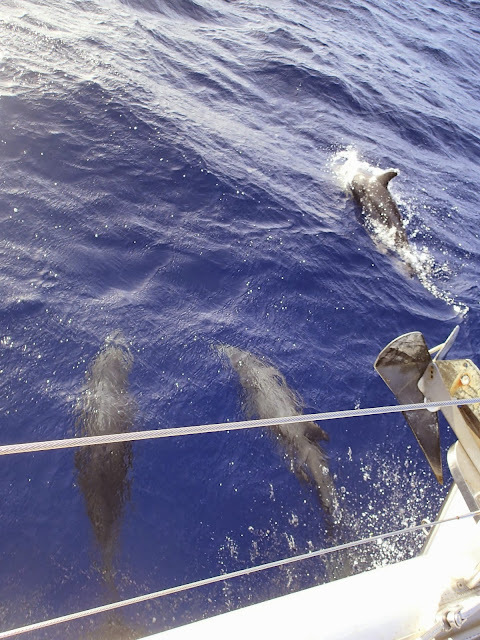 A pod of dolphins, maybe 8-9 joined our boat for quite sometime and we all 3 stood up front not minding the sea spray as they played off our bow jumping about. 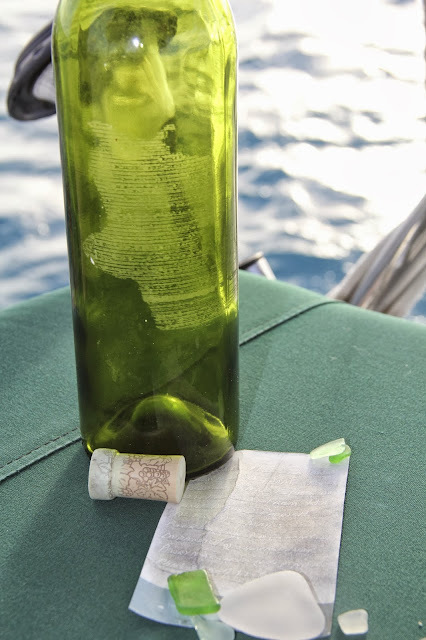 Had a nice chat with the "message in a bottle" sender. Turns out the message went to sea in February 2013 off a Norwegian Cruise Ship. Ken was suprised to hear the message was found and anxious to hear more about the route it took. Wow...What adventures!! Im REALLY glad you guys weren't swallowed in a wave. That sounds scary. Don't do that again..ok!?!? Next time..be patient. 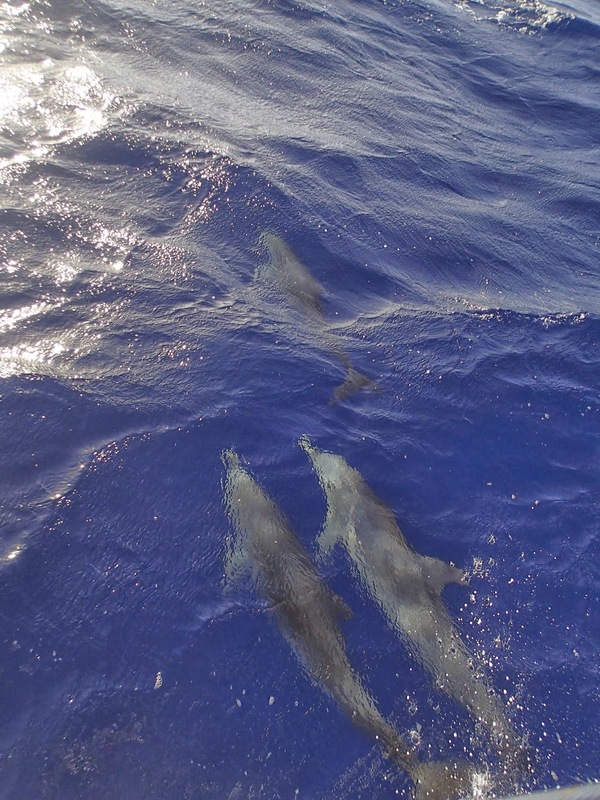 My girls loved the pics of the dolphins and the spooky crab. And the message in a bottle...they said "that's crazy"
All I can say is "you bastards! ".....I am jealously tracking you guys!